Image Credit & Copyright: NASA/ESA and the Hubble SM4 ERO Team. You may be confused by the “ZOOM” thing as this image has nothing to do with the previous image but this is a different kind of “ZOOM” that you will understand next post so hang in there. What an intriguing mess this is from start to finish. Let’s….uuh, attempt to sort out this galactic train wreck. As usual, the best place to start is at start; this region of Pegasus (The Winged Horse) goes by the name of Stephan’s Quintet or the Hickson Compact Group 92 (HCG 92) and it’s a tight group of five galaxies interacting with each other through gravitational tidal forces. The only problem is, they’re not all interacting but they are a tight line of sight group of galaxies on the sky as we view them. Let’s introduce you to the members. Starting at the upper left you see the big blue spiral galaxy (“Blue you’re my BOY”) cataloged as NGC 7320. This galaxy is truly just a line of sight addition to the group as it’s only about 40 million light years from us while the three main interacting galaxies are 290 million light years away. At top right is the wild looking barred spiral galaxy NGC 7319 whose spiral arms almost trail back around to the opposite bar; one side actually does. The red dots above and to the right of the core are clusters of many thousands of stars. Next, in the middle is the double galaxy NGC 7318A and 7318B. It’s pretty easy to see the double cores and bar structures of these two galaxies. Around them are wildly flowing arms that, as they interact come to life with star formation. That fuzzy thing at bottom left is the much more distant elliptical galaxy NGC 7317. As with most elliptical galaxies, there’s almost no star formation to speak of. This big ball of stars was likely caused my previous collisions that rendered any spiral shapes extinct in those systems. This galaxy is also apparently a line of sight galaxy as it seems no tidal forces from the group are disturbing it. So to summarize, the left galaxies aren’t interacting with any other galaxies. The top left blue spiral is much closer and the yellow elliptical galaxy at bottom left is further beyond. The three galaxies on the right are proverbial trains in mid-wreck. POP QUIZ: In the 1946 Christmas movie “It’s A Wonderful Life” Stephan’s Quintet makes a special guest appearance portraying God and two angels having a conversation. The galaxies represent God and one of the angels and I think a star represents the other angel, I dunno (not important). But remember, this was a movie from 1946 and it was a pretty good picture. My question is. What telescope produced the image in that movie? 2 things here; first, don’t ask me because I haven’t been able to procure an answer, ever (lots of best guesses though). And 2, try and come up with some evidence, its hard! 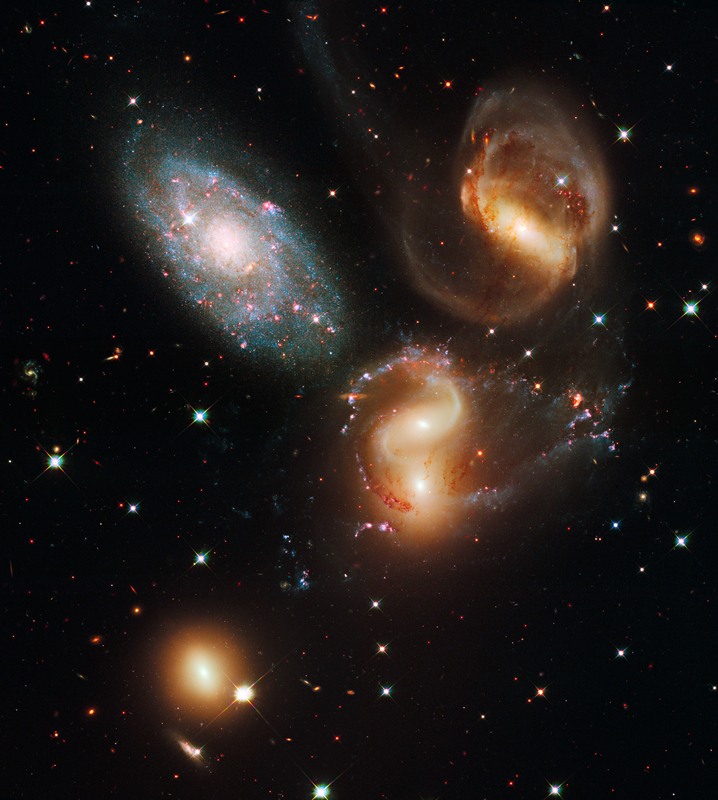 NAME: Stephan’s Quintet, Hickson Compact Group 92 (HCG 92). WHAT IS IT? : A compact group of interacting galaxies though not all are interacting. HOW FAR AWAY IS IT? : 290 million light years but the line of sight NGC 7320 is only 40 million light years away. HOW BIG IS IT? : The field of view here spans about 345,000 light years in diameter. DISCOVERY: Edouard M. Stephan in 1877 at Marseille Observatory, France. APPARENT MAGNITUDE? : NGC 7320 (brightest member) is a very dim +13. WHERE IS IT? 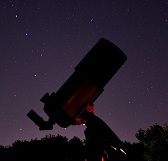 (General): Constellation Pegesus. WHERE IS IT? (Exact RA/DEC J2000): R.A. 22h 35m 57s.51 / Dec. +33° 57′ 35″.68. Image | This entry was posted in Astronomy (Learning), Astrophotography (DSOs), Galaxies, Images, ZOOM Posts and tagged Astronomy, Astrophotography, Cosmology, Cosmos, DanSpace77, ESA, Hubble, Interstellar, NASA, Science, Space, STEAM, STEM, Stephans Quintet, Telescope. Bookmark the permalink.